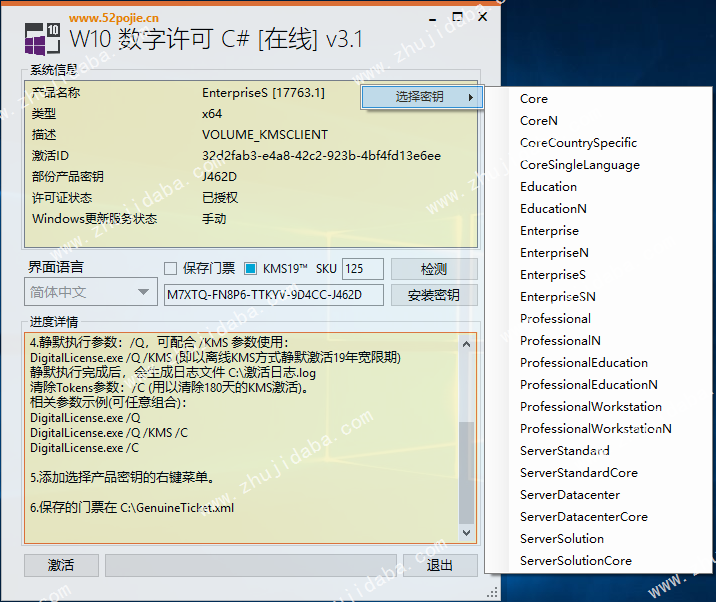 来自国内大牛@angelkyo 发布的 W10 Digital License Generation v3.1 (C# version of HWID fork). The KMS 19-year method is independent of the form of a selection box that theoretically supports all system activations for 19 years. Added Server 2019 support (KMS channel, activated for 19 years). DigitalLicense.exe /Q ---Silently execute to get digital license. DigitalLicense.exe /Q /KMS /C ---The 19-year grace period is silently acquired in KMS mode, and Tokens parameters (such as 180-day KMS) are cleared throughout the process. DigitalLicense.exe /C ---There is a GUI interface, and the Tokens parameter will be cleared during the process of clicking the [Activate] button.